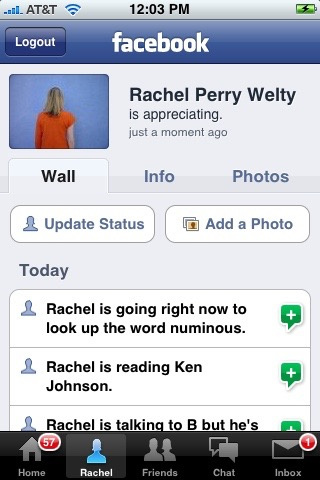 On March 11, 2009, from 7:35 a.m. to 10:56 p.m., I performed "Rachel is" in my status bar on Facebook. 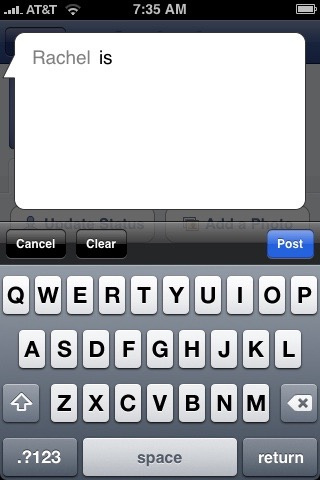 Every sixty-seconds during waking hours I attempted to faithfully answer the question posed in the status bar, "What are you doing right now?" in an effort to raise more questions about narcissism, voyeurism, privacy, identity and authority as issues we consider in a technologically modern world.